In order to hype the upcoming release of Tamako Love Story on Blu-ray/DVD this week in Japan, I’ve taken the liberty to translate a couple of interviews with the director, Naoko Yamada. Here’s the first of them! Tamako Kitashirakawa is the daughter of a mochi shopkeeper in the Bunny Mountain Shopping District. Tamako Market, the TV series which aired in 2013, begins when Tamako meets a talking bird from a southern island. The heartful comedy depicts people’s connections and love between Tamako’s friends as well as the shopkeepers in the shopping district. Coupled with the thorough work Kyoto Animation is known for with a warm story, the series was valued quite highly. 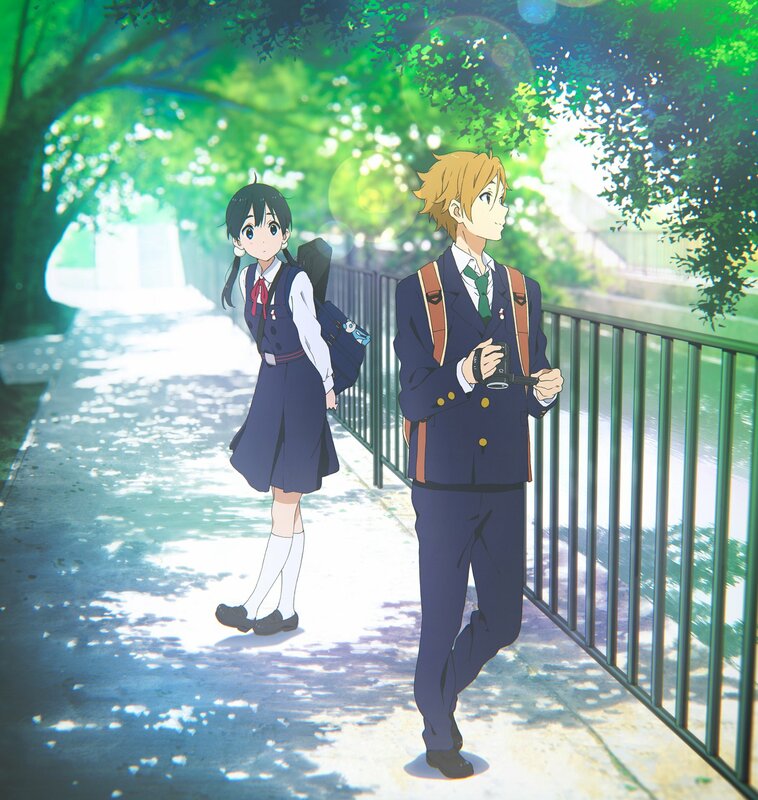 And so the sequel work, Tamako Love Story opened on April 26th. The orthodox adolescent love story is a new tale that shows a slightly different mood than the TV series. In order to find the highlights of the film as well as discuss production secrets, we went to speak with the director, Naoko Yamada. – Firstly, can you tell us how this movie’s creation began? – It felt like the time between when this was announced it’d be a movie and when it would open was quite short. How long were you in production of the film? – This is an entirely new film, right? How hard was it to make? – What about it was particularly troublesome? Yamada: The times where multiple things at once wouldn’t progress was very horrible. The staff affected by it were able to lift their spirits and felt like they could get through it though. – Having been able to take a look at the script for the movie, it feels much more serious than the TV series. 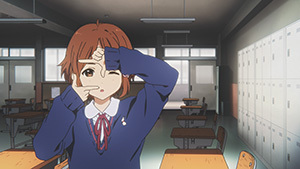 Yamada: During the planning stages, we also wanted to lean towards something comedic and fun like the TV series, but when I thought about what we didn’t do in the series, I came to a conclusion that “I want to properly delve into Tamako.” Wouldn’t it be nice to draw her as she’s a truly life-sized girl, when she’s a third year high schooler? The movie could focus on her relationship with Mochizou and dig deeper into herself as the highlights. That’s when I became serious about it. – In recent years there haven’t been any straightforward love stories, haven’t there? Yamada: That’s, that’s right! This time, I innocently stuck to a “not bashful” motif. When I drew the storyboards, I wanted the camerawork to not make the audience feel bashful or make you avert your eyes in embarrassment. “Watch this without feeling embarrassed!” I also talked with Yoshida-san and the music team about working straightforward without feeling bashful. – The title Tamako Love Story feels perfect for the film. What made you decide on that particular title? Yamada: It was originally the temporary title that Yoshida-san had chosen for the scenario. Calling something a “love story” adds a certain weight to whatever it’s attached to, but when I read the finished scenario, it felt like it had become a work that could be burdened by that title. Additionally, there were a lot of other titles I thought about, but since it was important to be straightforward, I came back to that title. – Understandable. So, what in the story or direction did you take careful notice of? Yamada: In addition to being uneasy about the production, I took note of my “conveyed direction.” This isn’t a long film, so I wanted to make the messages conveyable and simple to understand so that the audience wouldn’t be left with any questions. – What scene is your favorite? Yamada: The point where Mochizou is spending time with his friends in the movie research society room. I was aware that his scenes in the TV series were almost always being brought along with Tamako, but that isn’t the case here. This is a Mochizou who is calm and down to earth. It feels fresh. 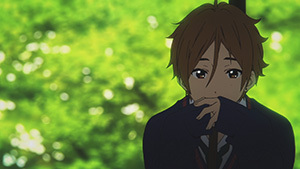 Also the scene where Tamako talks to Midori in a monologue about the secret between them that she holds. I love how you’re able to look into the secret between the two girls. – That reminds me of something. I read on the net that “Tamako’s eyebrows may have been straightened (from the TV series).” Is that true? 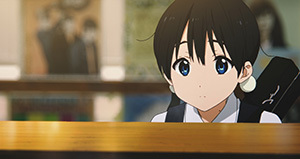 Yamada: The Tamako in Tamako Love Story is a girl who has grown to be without any slack. Along with that her eyebrows were straightened. Don’t you think the change looks splendid? – Then which character is your favorite? Yamada: The florist Kaoru-san (of the Florist Princess shop). The shopkeepers’ appearances were more reserved in the film, but I wanted to develop more the way she advises Tamako like an older sister. – Continuing from that, I have a question about the recording. What kind of orders did you give the seiyuu as they were performing? Yamada: I requested that Tamako, Midori, and Kanna be performed as they usually are, 17 year old girls. While this was a movie, it’s better if it doesn’t become a drama. – Do you have anything to say regarding the music of the film? Yamada: Since the love song that Tamako’s father (Mamedai) sang for her mother (Hinako) is very much intertwined with this story, there’s both the father and Tamako versions of the song as the OP and ED of the film. – Wait, the father’s song is the opening? Yamada: Tamako Love Story opens with Mamedai-san’s singing voice. (laughs) Along with Mochizou’s narration, I wanted to insert the point of view from the boys falling for the girls. Since Mamedai’s song is about the time he fell in love (with Hinako), I put it as a theme song for the film. – That is astounding. (laughs) By the way, you mentioned earlier that at first the film leaned toward the more comedic side of things. What kind of things were you envisioning? – That reminds me, Dera had the role of pulling the story along in the TV series yet he doesn’t appear at all in the movie. Yamada: There’s no way that Dera-chan would be that kind of hindrance. (laughs) This movie focuses on fully seeing Tamako, so since there was a problem of how to fit him into that theme, it became what you will see. – Since we’re talking about him, what kind of work is the short that’s being shown before the movie, Dera-chan on the Southern Island? – Any developments along the Choi-chan and Prince Mecha relationship? Yamada: There’s none in the short, however that is shown in the novel version in a Choi-chan Love Story short. – I look forward to reading that! Let’s return to Tamako Love Story. What are some highlights we should look forward to seeing in the movie? Yamada: The embarrassment, darkness, and light of adolescence is very important. I kept that in mind as we made the visuals. It wasn’t just the layouts or the character positioning, but the coloring was also very important to display that motif. I thought about various ways to make the audience be absorbed in that sensation while discussing things like how the lens focus and the atmosphere with the characters alongside the background staff, color coordinators, and photographers. Regarding the backgrounds, in Tamako Market, we drew a bright and cheerful image, but this time we wanted it to feel heavily realistic. Due to that, I think the images shown have changed quite a lot for the film. – What would be the theme of the movie in one sentence? Yamada: “The courage to take a step forward.” Sometimes taking that first step can be quite difficult, but all the teenagers in this film take a step forward in their own ways. 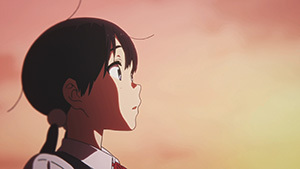 Though it’s Tamako’s story, I think it’s great to appreciate everyone else’s growth. – Finally, would you give a message to all the fans waiting to see the film? Yamada: This is an important film that I gave my all during the making process for people to see. For those seeing the film or somehow getting dragged along, I hope you enjoy it! – Thank you very much for today. Please look forward to seeing the film! This entry was posted in Kyoto Animation, Tamako Market, Translations and tagged interview, love, naoko, Story, tamako, Translation, yanada. Bookmark the permalink. Why can’t she answer the question about the duration the film took to finish?